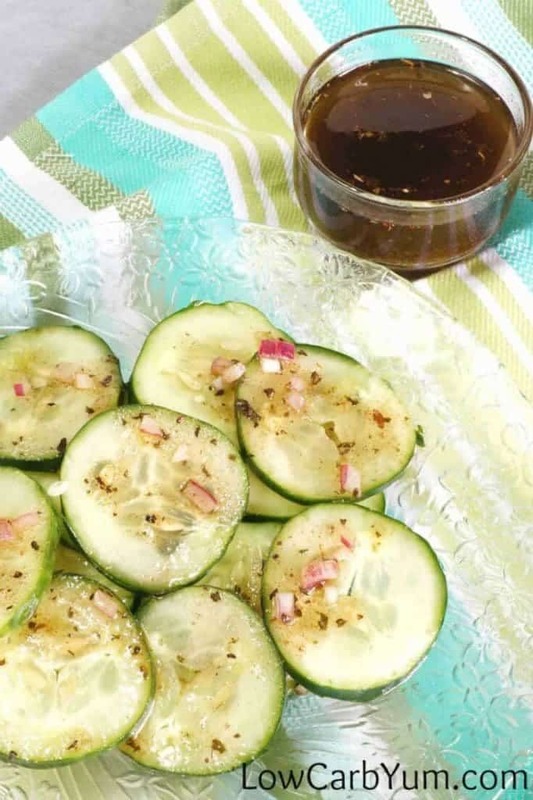 Cucumber salad typically has sugar added to offset the vinegar. 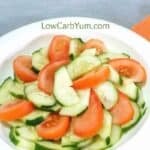 This low carb apple cider vinegar cucumber salad recipe uses stevia as the sweetener. Our garden is flourishing with fresh cucumbers. Since it’s been such a great year for them, I’ve been enjoying them in summer salads. Cold salads are a staple for me in the hot summer weather. 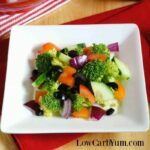 This is a refreshing cucumber salad with a basic oil and vinegar dressing. I’ve been making this salad for many years. 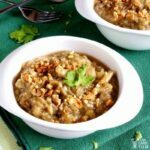 Apple cider vinegar has always been my vinegar of choice for the dressing. And, it has been known to have a lot of health benefits. You can add tomatoes to this if you want, but I like to keep it simple. 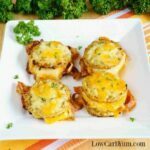 The onions can also be left out if you want to cut back on the carbs. 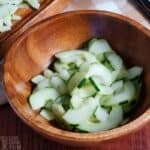 Out of all the cucumber salad recipes I have, this one made with apple cider vinegar is my favorite. It’s sure to become one of your favorites too! 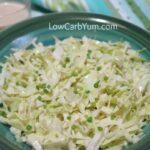 And, it takes very little effort to make this super simple salad recipe. You just need to slice the cucumbers and chop the onion. Then mix up the dressing ingredients and pour over the cucumber mix. How easy is that? 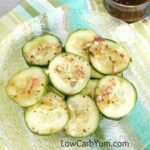 This apple cider vinegar cucumber salad is one of the first recipes I tried with stevia sweetener. 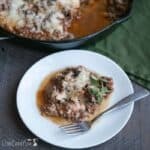 Stevia is the perfect low carb sweetener to tone down the vinegar and make it more palatable without adding any carbs. The cucumbers in the markets are never as good as the ones freshly picked from a home garden. I wish the growing season wasn’t so short in Connecticut. I’d be eating more fresh produce throughout the year. When I do buy cucumbers in the grocery store, I prefer the burpless English cucumbers that are long and thin. They usually aren’t waxed and I like the mild taste that doesn’t lead to the adverse indigestion type effect. There’s so many great summer salads out there to use fresh cucumbers in. 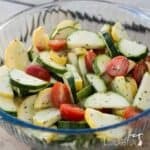 Although this one is my favorite, I’ve also got a few other cucumber salad recipes. One is a creamy version, and the other is a Japanese style. There’s also one with tomatoes, too. 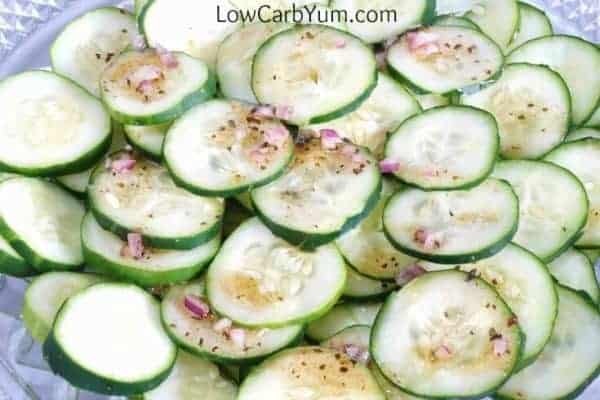 What’s your favorites recipe for making a cucumber salad? 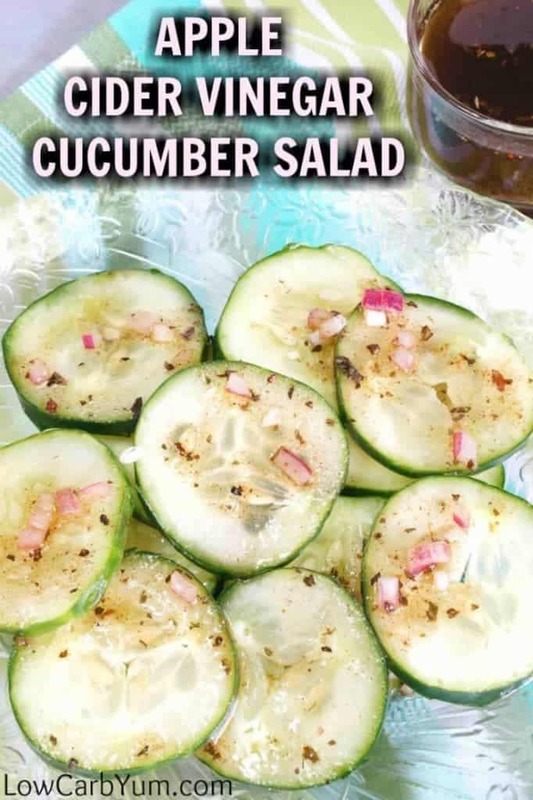 Cucumber salad typically has sugar added to offset the vinegar. 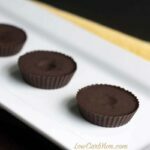 This low carb version uses stevia as the sweetener. 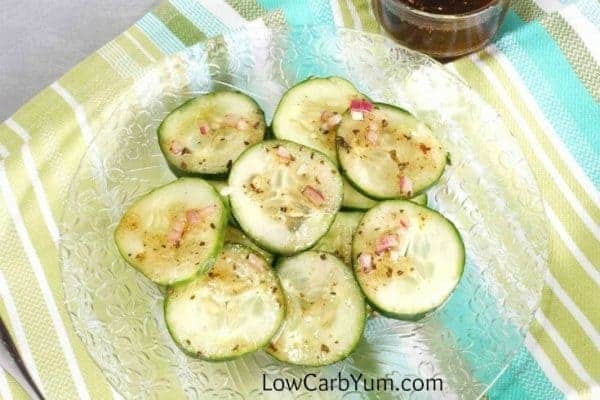 Slice cucumbers and place in a large bowl. 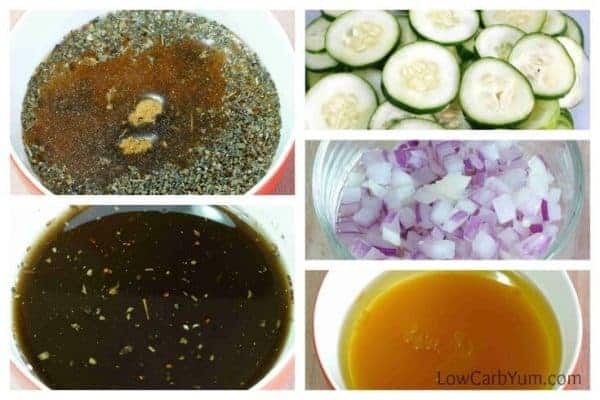 Pour oil and vinegar over cucumbers. Toss to coat.